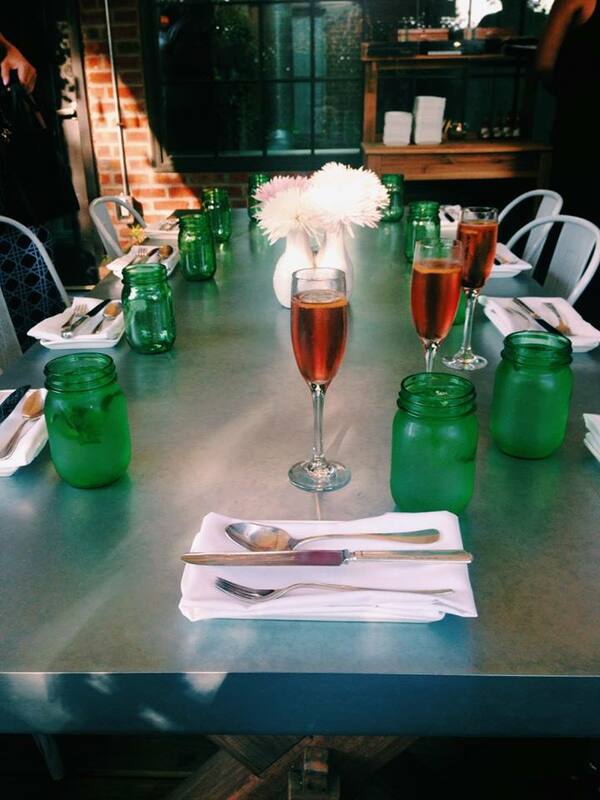 The Rose’s Luxury Roof Garden Experience | Thank You. Cooperate. It’s like a scene out of an Ocean’s Eleven movie. Only instead of robbing a casino or stealing a Fabergé egg, the heist you’ve pulled off is scoring the much coveted reservation of the roof garden at Rose’s Luxury. You’ll get there around 6:30. Stroll past the line of people waiting to put their names down for a phone call later for a table. Don’t feel guilty for skipping the line, luck and nimble typing fingers earned you the privilege. Walk past the room full of diners. 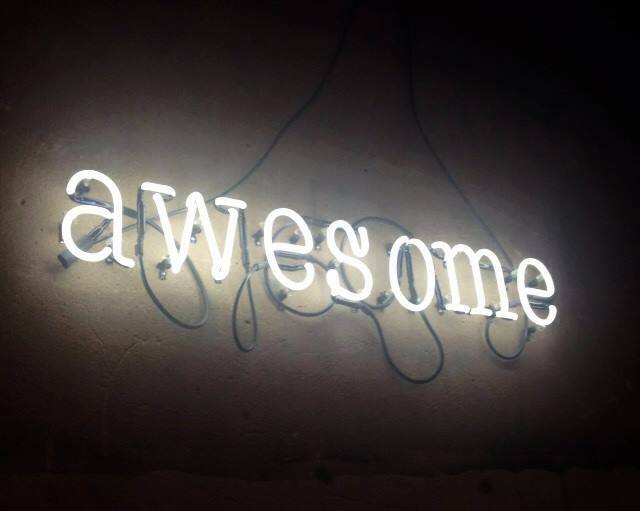 Make sure to take a glance at the neon sign that says, “AWESOME” on the wall facing the kitchen. Remember that word. You’ll need it a lot tonight. One by one your friends walk in. Hugs and kisses all around. You’ve all made it. You’re here. Read: We’re gonna have a good time tonight. Each night is different. Each experience is its own. The only constant is that that they’ll just keep feeding you until you cry “uncle” and tap out. However, this ain’t Sizzler and it’s not a buffet. 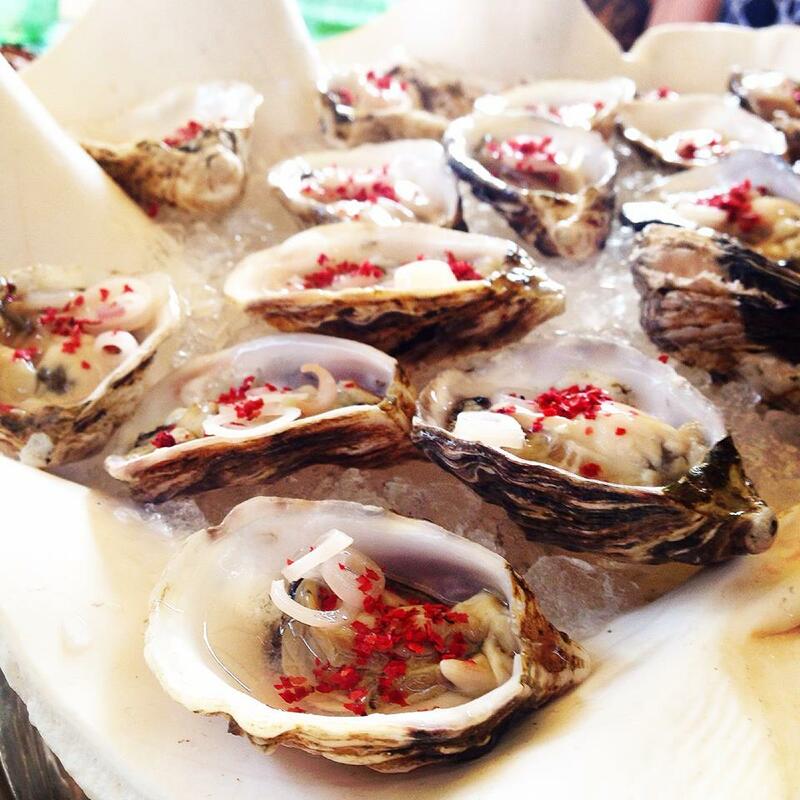 So don’t be that guy who demands, “Another round of oysters and lychee salad for my friends!” Simmer down. You’re not going home hungry. And now, please return your seat backs to their full upright and locked positions. Because here comes the food. A round of house baked challah bread with butter and honey. Poppy seeds dot a crunchy crust that twists around a fluffy, cotton-candy like interior. Go head and tear into it. No need to wait for your foodie friends to a take a picture. A massive half-shell filled with Stellar Bay oysters arrives. Raw with a ramp and rosé mignonette and crushed pink peppercorns. Briny, sweet, and refreshing. Jonah Crab claws with pickled ramps and chive mayo. No doubt a nod to a similar dish of crab claws and yuzu Kewpie mayo from Chef David Chang’s Momofuku Noodle Bar, where Chef Silverman worked during his time in New York City. The sharpness of the ramps and tanginess of the mayo is the perfect counterpoint to the buttery crab claws. Next up, a spring onion salad nestled on a layer of homemade goat’s milk ricotta. All on top of a slice of house-made crusty, sourdough bread. This salad is red, white, and ramps. Tart, savory, crunchy. Then comes a surprise. Thea arrives with a tray of little glass jars with buckled rubber seals. Inside, the now off-menu popcorn soup with grilled lobster. Talk about an unexpected cameo! You know what makes this dish brilliant? Butter. What better complimentary ingredients than butter, lobster, and popcorn? The food isn’t the only inventive thing here. Fig Martinis, White Manhattans, and a deceptively potent English Pea Cocktail that comes in a shot glass are all available from the drinks menu. Kudos to Thea for patiently guiding our one “wine connoisseur” through Rose’s wine list. Take this time to glance down at your silverware. Our little spoons have portraits of past historic presidents engraved on them, complete with trivia! Get up and stretch. We’re about 2 hours in now and it’s a good time to stand up and take in the beautiful garden. Twinkling rope lights suspended above the table. The evening’s soundtrack just loud enough to be heard over everyone’s laughter. There are no distractions from waiters rushing by or obnoxious loud conversations from other diners. It’s just you and your best friends, enjoying life. Grilled asparagus with pineapple, and jalapeño tempura. Smokey, sweet, and crunchy. The unexpected pineapples give it the perfect summer twist. Then comes the Pork Sausage and Lychee Salad. 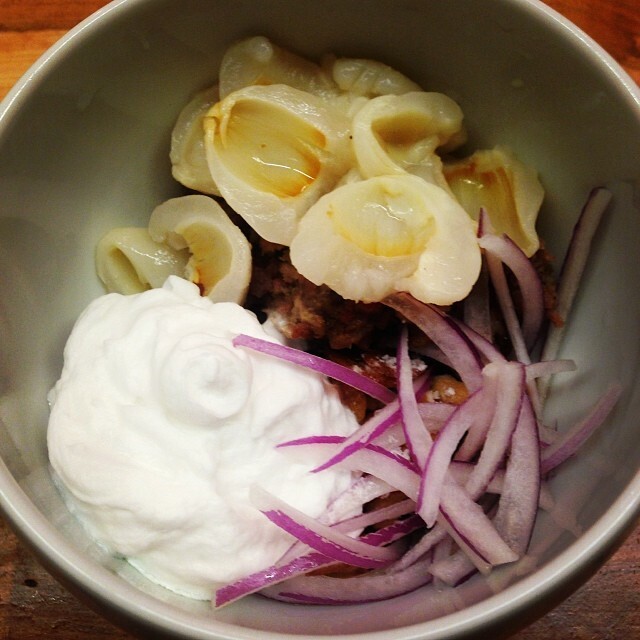 One of my favorite dishes of 2013-14, this thing’s got all fives tastes in one bowl. Pork sausage, lychee, coconut foam, and little bit of habanero just to spice things up. Slivers of onion and peanuts for some texture and crunch. 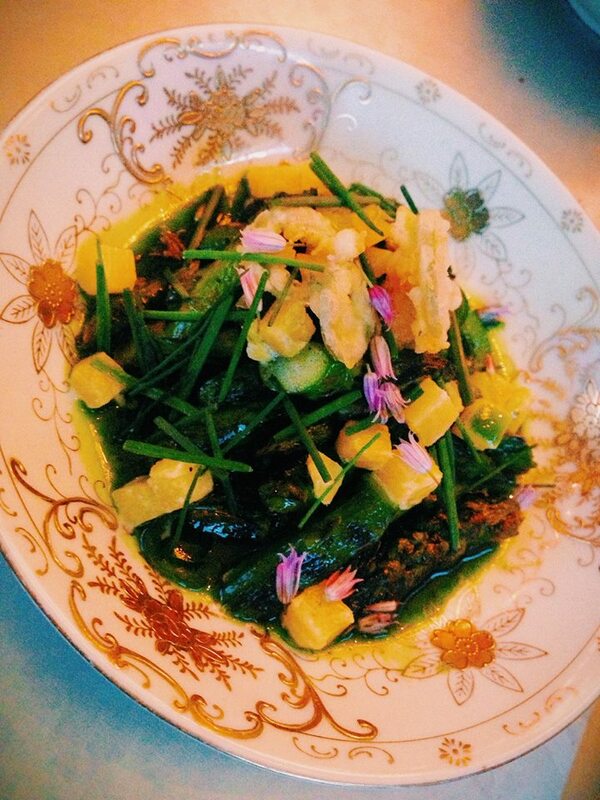 To not taste this dish at Rose’s is like going to an amusement park and not riding the roller coaster. Time for some carbs. At this stage of the game, you’ll gonna need something to soak up all the wine and cocktails. First up, a pasta interpretation of the classic Escargots à la Bourguignonne. 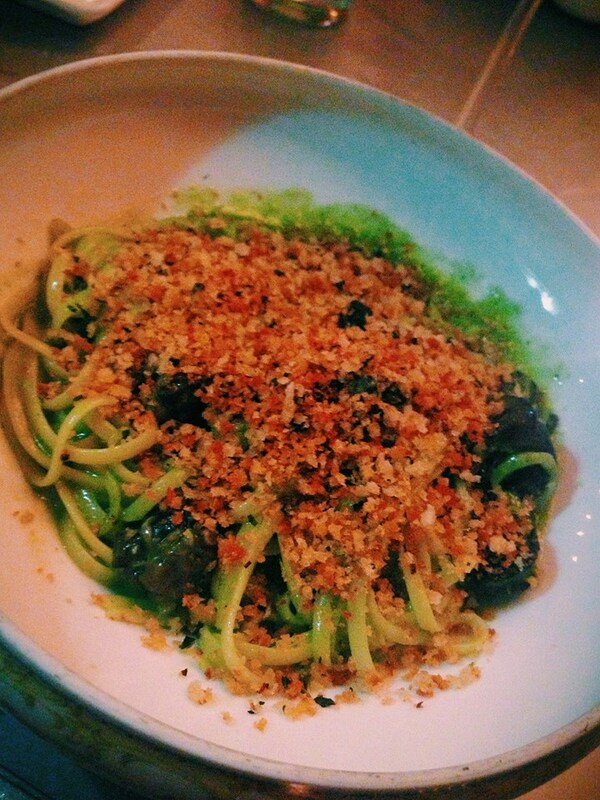 Herb garlic butter over house-made pasta with chewy snails and topped with parmesan bread crumbs. 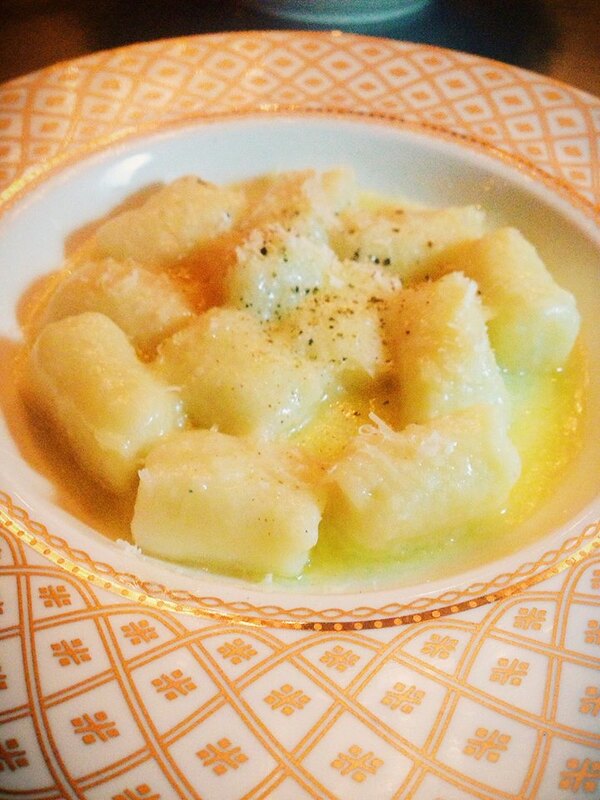 Then “Marco’s Gnocchi“ with black pepper and parmesan. Little pasta pillows so light they are like whipped butter potatoes suspended in air. Both dishes are luscious. With pastas this delicious and decadent, even someone who might be carb-phobic won’t be able to stay away. But wait, don’t go all in, not just yet. Because here comes the coup de grace. 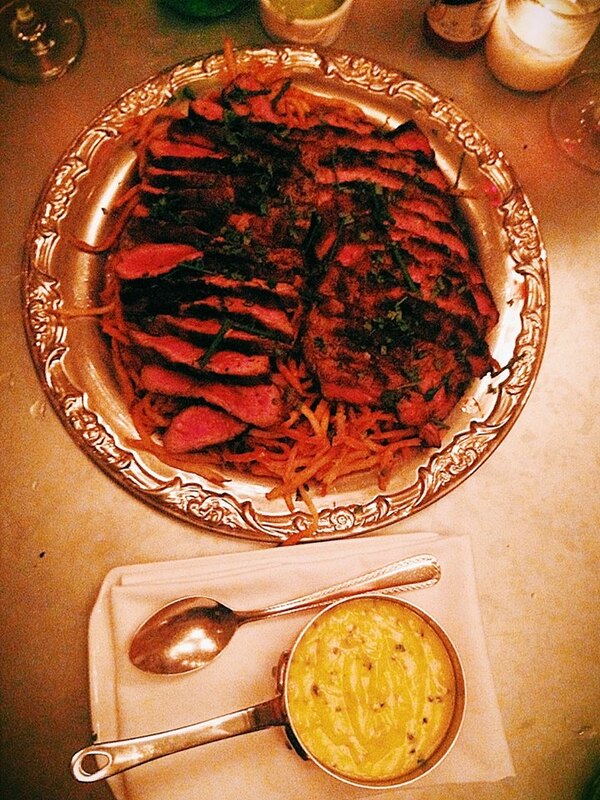 A giant platter of Delmonico steak seared to meltingly medium rare, thinly sliced and served with shoe string fries and Bernaise sauce that would have impressed Henry the VIII himself. The other giant platter was our second surprise cameo of the night. Another fan favorite dish that’s now off the menu. 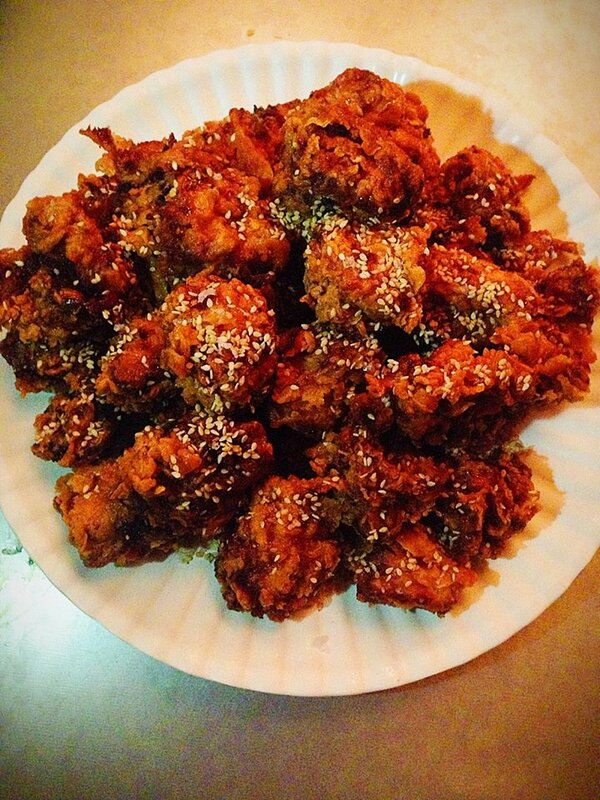 The pickle-brined fried chicken with honey and benne seeds. These crispy nuggets of pure joy are sweet, juicy, and with just the perfect amount of crunch. If they served chicken nuggets in Heaven, it would be these. Lastly, a dish that is often referred to as “Charleston Ice Cream.” Heirloom Carolina Gold Rice from Anson Mills Farm in South Carolina; and butter. Though rich and creamy, each grain of rice still retains its individual texture. It’ll probably be the best rice dish you’ll ever taste. If you’re still hungry there’s an eating contest waiting for you at Coney Island next July 4th. For the rest of us, we’re pretty much at the “wafer thin” level of done. But nope, there’s just a little more. Two desserts. A spring pea sponge cake with mint curd and pea shoots. And a spicy ice cream with chocolate brittle. Oh, and how about some orange slices and a little spoon full of chocolate just in case you’re not ready to burst yet. After nearly 5 hours of drinking and eating you’re not just drunk from all the wine and cocktails, you’re also drunk on food. As the haze of happy contentment slowly sets in, it’s time to call it a night. Thea returns one last time carrying doggie bags, one for each of us. 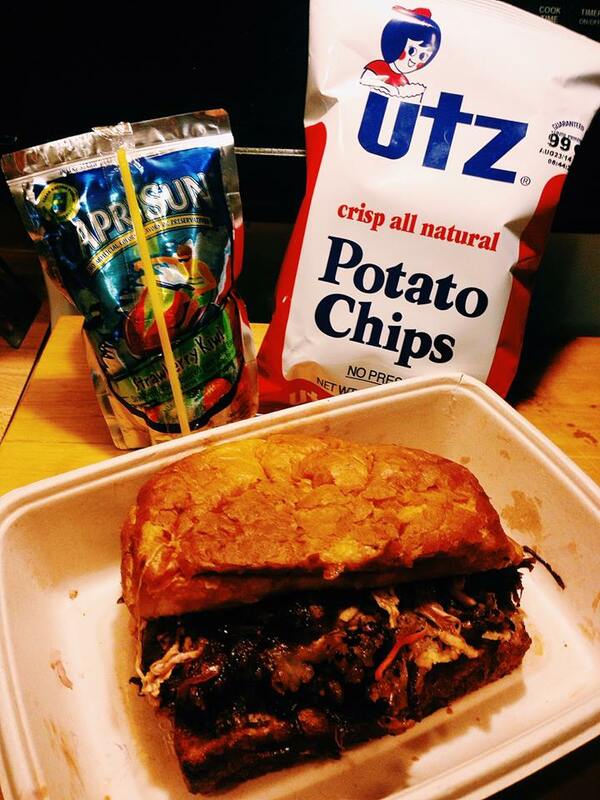 The kitchen has graciously divied up what we couldn’t finish into equal portions and surprise – lunch for tomorrow – a giant smoked brisket sandwich complete with a bag of Utz potato chips and a Capri Sun juice pouch! I want to have my mail delivered here. 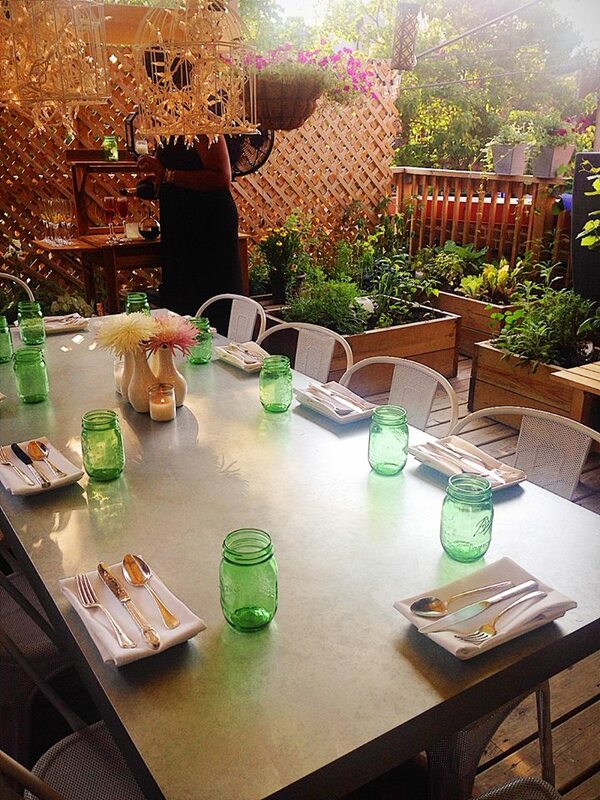 The Rose’s Luxury Roof Garden experience is epic. From the first cocktail to the last spoon full, everything is thought out for you to have a blast. The quiet and private setting, the background music with just the right vibe, and your own server who transcends the role and becomes part of your party. This is what all tasting menu experiences should be. It’s fun, non-pretentious, and a perfectly designed menu that gradually takes you to higher plane of happiness. As we literally descend down the stairs from our happy place. I tried to come up with the perfect word to describe our bacchanalian evening. Then I realized the answer was there all along, in the form of a glowing neon sign. Oh and then there this – Tomorrow’s lunch. 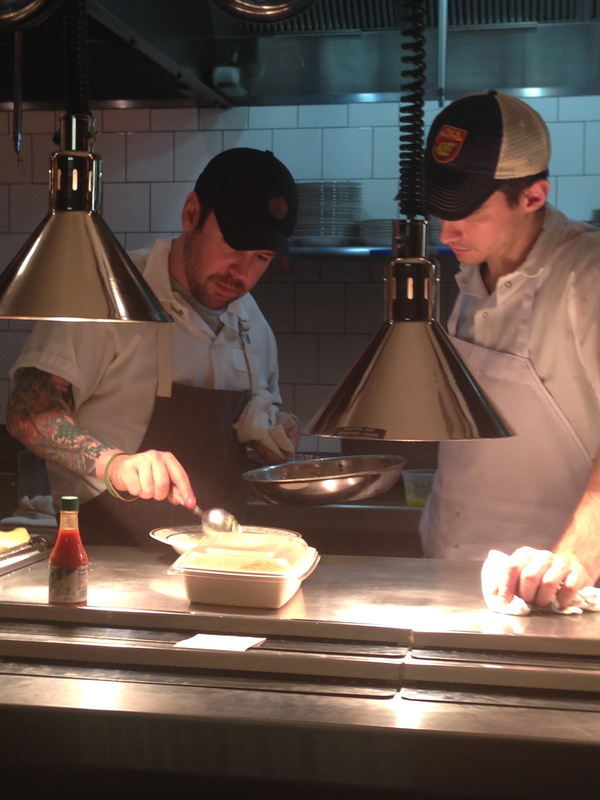 ← Remember the time Chef Tom Colicchio gave me props on Twitter? This really does sound awesome. Hoping nimble fingers will get me there at some point. In the meantime, I’ll just stand in line with the rest of the slow pokes.